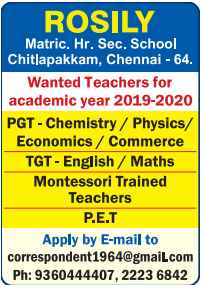 Rosily Matriculation Higher Secondary School,Chennai ,Tamil Nadu Advertised in The Hindu paper for the Teachers recruitment 2019 – Teachers Jobs. For More Details see below. About School: Rosily Matriculation Hr. Sec. School was started in 1999 at Chitlapakkam,Chennai-64.by the Rosily Educational and Charitable Trust(REACT) ,regd. Since then it has been serve the people in and around this locality.Salient features of this school are individual attention,concept teaching,holistic personality development and discipline. Special training is given in music, dance, dramatics, drawing, band, yogasana, physical and health education. Teaching is made pleasant with various child centred activities,multimedia for lower classes and computer education from class I.Eco club,literary clubs,quizzing,assembly programmes, study trips,project works,cultural programmes,seminars,service oriented activities,personality development camp,girl guides,boy scouts training junior red cross society etc., are part of human education.Every activity in the school has value education as its integral part.